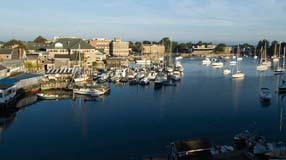 The University forms an affiliation with the Marine Biological Laboratory in Woods Hole, Massachusetts. The economic historian, whose studies of slavery and the impact of railroads in the 19th century challenged conventional wisdom, was 86. Gregory Wendt, AB'83, uses philanthropy to help more students have transformative experiences--and a great time--at UChicago. The latest Colloquium is an unlikely anthology, say its editors, and they couldn't be prouder. Influential in the evolution of improvisation and sketch comedy, Sahlins, AB'43, discovered talent such as Bill Murray, Dan Aykroyd, John Candy, Gilda Radner, and John Belushi. Avril D. Haines, AB'92, the top lawyer at the National Security Council, is appointed as the CIA's first female deputy director. Chicago Booth's Austan Goolsbee discusses unemployment, underemployment, and the growth rate of the economy. Roseanna Ander, executive director of the University of Chicago's Crime Lab, says the city faces a rising threat in warmer months. Leon R. Kass, SB'58, MD'62, explores why the Decalogue matters. A new UChicago study shows that people who have perfect pitch may not always hear what they think they hear. A justice, a judge, a philosopher, and an English professor.